Friday (Sunday) Happy Hour: Yeah, it’s late. Yeah, yeah, yeah. It’s Sunday. I didn’t do this on Friday. I get it. But I skipped the week before (based on the fact that there wasn’t a single question I even remotely had an answer to. So I thought I’d do Mental Floss’ Friday Happy Hour today. As always, questions come from the posts, but the answers are mine. 1. What’s a book that changed your life? I’m going to go with A Generous Orthodoxy by Brian McClaren. It really was the culmination of several years of thoughts I’d had about what Christianity is and should be compared to how it has been practiced in my experience. This book put a lot of words to thoughts I’d been having and opened and stretched my ways of thinking in a variety of ways in which it desperately needed to be stretched. All of those things ended up taking me off the pastoral track onto some track that I’m still not sure where it should lead. Off the institutional church track is a good thing… not knowing what that all means is difficult. Also it has one of the best subtitles ever: Why I am a missional, evangelical, post/protestant, liberal/conservative, mystical/poetic, biblical, charismatic/contemplative, fundamentalist/calvinist, anabaptist/anglican, methodist, catholic, green, incarnational, depressed-yet-hopeful, emergent, unfinished Christian. 2. Let’s pretend you stumbled upon a wish-granting genie. This genie is powerful, but not as generous as the “three wishes” genies you’ve read about. You only get one wish, and it’s pretty limiting—you can pick any one person and do his or her current job for one day. Who would you pick, and what would you do that day? I want Stan Weber’s job for one day. Not because I idolize him, by any means. For those who don’t know, he is K-State’s color analyst on radio for football and men’s basketball games. I actually find him very annoying and a way over the top homer. But that’s not the point. The point is I’ve always dreamed of being a radio sports announcer, and I got to try it out one time doing a small college football game. But to get to do my number one love, and alma mater, K-State? That would potentially be the greatest accomplishment of my life. So I’d like to replace Stan and call a game next to Wyatt (who I do like, and think does a very good job). Wait, what? I’m not a parent, nor am I aware of anything. So this question gets a lame answer. 4. I like to shamelessly use this space to get recommendations: books, comedians, podcasts, you name it. So let’s leave it wide open. What’s something (anything) you recommend? Here’s a podcast that’s a bit off the radar: Coyle and Sharpe. They stopped producing podcasts at 100 episodes, but the good news is that there are 100 episodes to listen to. Get there. Do it. Listen. They were duping people on the radio before morning guys knew they could. Each episode is just a couple minutes long, but they are laugh out loud hilarious. This is from before people knew that someone with a microphone could possibly not be telling the truth. The innocence of the people they interview along with the absolute ridiculousness of all they say is pure gold. The obvious answer for me is each of the Star Wars movies. I’m just a geek that way. 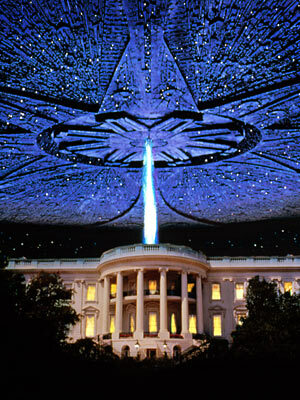 But the other one I’ll add in here is Independence Day. It’s just a cheesy fun big summer movie, but for what it was at the time it came out, I couldn’t get enough of it, and going to it became an event for me and the people I hung out with… ended up seeing it 4 times in the theater. 2. One of the first magazines I subscribed to was Nintendo Power. I remember reading a Letter to the Editor about a group of friends so intent on buying the game Ice Hockey, they flew all over North America and spent thousands of dollars trying to locate a copy. (I don’t know how fierce the editors were in verifying claims made in these letters.) No idea what made me think of that this morning. But have you ever gone on an elaborate quest, Harold & Kumar-style, to buy something on a whim? Where did your travels take you? Just this week in Kansas City… the quest for the Boulevard Chocolate Ale. Who knew that a beer could become the must have item? Checking every store, multiple times, I kept striking out, but now that it’s all said and done I managed to score 4 bottles, including the 4th bottle that I stopped this afternoon to pick up on the way to the airport. 3. We had our first-in-years company retreat last weekend in Durham, North Carolina, on the Duke University campus. While the words “company retreat” conjured up visions of icebreaker activities and trust falls, those exercises were replaced on our agenda with bowling and basketball and discussing what exactly made the hotel coffee so bad. That last one required breakout sessions. Have you ever had to go on a company retreat? How’d that work out? The best one I can think of is when I was a pastor. The denomination I worked for was pretty conservative and their idea of a fun retreat left a bit to be desired. Branson, Missouri… the place that represents all that is wrong with the world. 4. Every few months we end with the same simple question—what are you currently reading? Do you recommend it? I’m currently reading Open, Andre Agassi’s autobiography. I’m really fascinated by it. The range of things that can lead to someone’s greatness is really amazing. 1. In your opinion, at this point in your life, what’s the most rewatchable movie? Even though you’ve seen the film dozens of times, you’re excited to see it come on TV, you might own it and pop it in from time to time, and you don’t see yourself getting sick of it in the near future. Without question, for me this is Star Wars. Especially A New Hope. Though I never watch any movie when I see it on TV. I’d always rather pop in the DVD and watch it start to finish. Watching parts of movies ruins them for me. 2. Reader Anthony left this comment under our Nerf history article:“When my wife and I got married, the bridesmaids got little jewelry boxes as the their thank you gifts. The groomsmen? Nerf guns.”What’s the greatest bridesmaid/groomsman gift you’ve received (or given)? 3. If you don’t have an answer for #2 but still like talking about weddings, here’s a Happy Hour question from 2009:I’ve been to my share of weddings over the years, and they all went as planned. No bride or groom ever failed to show or said the wrong name or fled the altar. No former lovers ever interrupted the ceremony, and everyone else chose to forever hold their peace. Of course, weddings in books, movies, and TV shows get screwed up all the time. Have you ever been to a wedding where, for whatever reason, nobody got married? No, but this could be a really cool story if it did happen… as long as it wasn’t anyone close to me. One of those “only there because I feel obligated” sorts of weddings. Especially if I got them some kind of cool gift that I could now keep. 4. You’ve been tapped to open a new museum in whatever city you’re currently living. You should pick something you’re interested in, but also something that will appeal to your fellow citizens. With those two caveats in mind, what will be the name of your new museum? This one seems simple to me (and why hasn’t someone already done it?!?!) 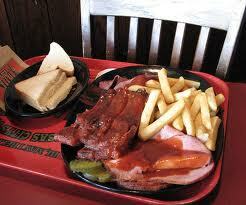 The Kansas City Museum of Barbecue. Items and memorabilia from all the great KC BBQ places… Bryant’s, Gate’s, Smokestack, and more. An area that compares and contrasts techniques is a must. And by far, the main attraction is the tasting room.